icle lift, can fly autonomously or be piloted remotely, can be expendable or recoverable, and can carry a lethal or nonlethal payload”. Therefore, cruise missiles are not considered UAVs, because, like many other guided missiles, the vehicle itself is a weapon that is not reused, even though it is also unmanned and in some cases remotely guided. 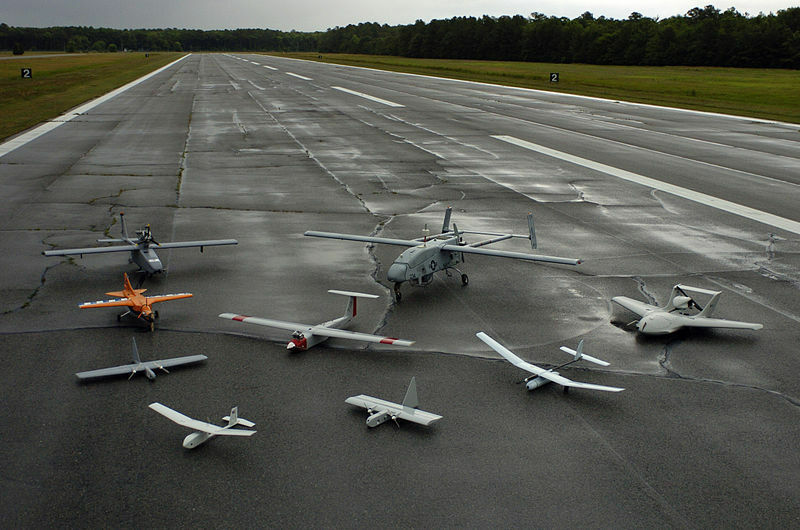 There are a wide variety of UAV shapes, sizes, configurations, and characteristics. Historically, UAVs were simple drones (remotely piloted aircraft), but autonomous control is increasingly being employed in UAVs. UAVs come in two varieties: some are controlled from a remote location (which may even be many thousands of kilometers away, on another continent), and others fly autonomously based on pre-programmed flight plans using more complex dynamic automation systems. Currently, military UAVs perform reconnaissance as well as attack missions. While many successful drone attacks on militants have been reported, they have a reputation of being prone to collateral damage and/or erroneous targeting, as with many other weapon types. UAVs are also used in a small but growing number of civil applications, such as firefighting or nonmilitary security work, such as surveillance of pipelines. UAVs are often preferred for missions that are too “dull, dirty, or dangerous” for manned aircraft. The Senate on Monday passed a $34.5 billion measure, by a vote of 93-0, that would upgrade the nation’s aging air traffic control system, limit tarmac delays for passengers and increase taxes on several areas within the airline industry. The bill, which funds the Federal Aviation Administration through September 2011, calls for the air traffic control system to switch from World War II-era radar technology to a satellite-based system by 2014 at the busiest airports, and nationwide by 2020. The new system known as NextGen would cost the FAA about $22 billion through 2025 while airlines would spend about $20 billion to upgrade their airplanes’ computer systems. With the numbers of airline passengers growing, the new air traffic system is expected in the long term to increase safety, save airlines money, reduce delays and cut down on pollution because pilots will be able to fly more direct routes. The bill, which will have to be ironed out in a House-Senate conference, raises an additional $276 million in revenue from the expansion of several taxes. The measure sets the general aviation jet fuel tax rate at 36 cents a gallon, up from 22 cents. That is expected to raise about $113 million through 2014. Private business jet charters would see taxes increase from 4.4 cents a gallon to 36 cents, and they would pay as an a 14-cent surtax on fuel, which is expected to raise $107 million through 2014. In addition, planes weighing 6,000 pounds, which were previously exempt from the taxes, would have to pay into the Airport and Airway Trust Fund, raising about $56 million over 10 years. Under the Senate bill only sightseeing planes are exempt. Comprehensive management, engineering and technical support services. May 14, 2010 – ClancyJG International is certified by the Small Business Administration (SBA) as an 8(a) Business Development Program Participant. September 24, 2009 – ClancyJG International is awarded a contract by the Federal Aviation Administration (FAA) to provide support to the Unmanned Aircraft Systems (UAS) Office. As the support contractor, ClancyJG International provides the Unmanned Aircraft Systems (UAS) expert technical, analytical, and planning support services. September 15, 2009 – ClancyJG International, as a member of the Management and Engineering Technologies International Inc. (METI) Team, is please to announce that our Team has been selected as one of the successful offerors to participate in the Electronic FAA Accelerated and Simplified Tasks (eFAST). The FAA entered into multiple Master Ordering Agreements (MOAs) with Small Businesses, 8(a), Women-Owned, Socially and Economically Disadvantaged Businesses (SEDB) to provide comprehensive management, engineering and technical support services. Thank you for your interest in ClancyJG International. For information please use any of the contact options stated below with your contact information and a brief description of your need. We look forward to quickly responding to your inquiry.